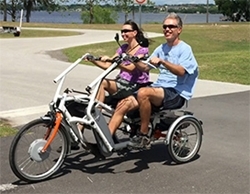 A recumbent tandem bicycle can be the perfect answer to your search for shared fun and a great workout. A more conventional two-wheeled tandem bicycle may be a bit of a challenge for some riders. They can be hard for an inexperienced tandem rider to start from a dead stop due to balance issues. 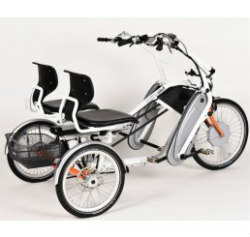 With a side by side recumbent tandem bicycle the learning time, that it usually takes to ride a conventional tandem bicycle is eliminated so climb on and enjoy. Another great feature of this tandem is riders of different fitness and skill levels can ride together. No more puffing to catch up with the other rider or looking over your shoulder to see where the heck your companion is. You can communicate with each other easily which is a safer way to ride as well. And there is never a concern about balancing. 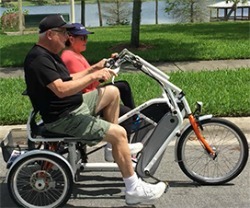 On the Orion side by side, the driver handles the steering and shifting but the independent pedaling system enables the passenger to coast while the driver is pedaling. This bicycle has tons of adjustability for optimum comfort and pedaling efficiency as well as ergonomically designed seat and seat backs for more support. The eight-speed Shimano Nexus gear system helps to flatten out those nasty hills. The seats even pivot for easier mounting and dismounting. Front Tire: 24 x 1.75"
Rider Inner Leg Length (Inseam): 29.5 - 35.5"
Seat Height from Ground: 25.5"
For complete specifications go here. Looking for more recumbents? Go here.